Maybe cut grass, fresh coffee, the smell of a crisp autumn day? For me, it's got to be a scented posy. 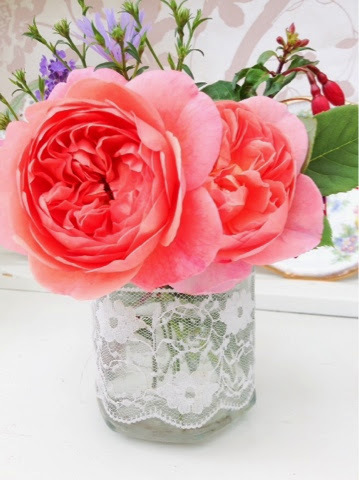 This little scented jam jar posy is so easy to make, such a simple idea and a gorgeous gift for a friend. I actually dotted these around our wedding venue too. I don't need to tell you how to make it. It's an idea.... It speaks for itself! But I love to fill mine with whatever is in our garden. 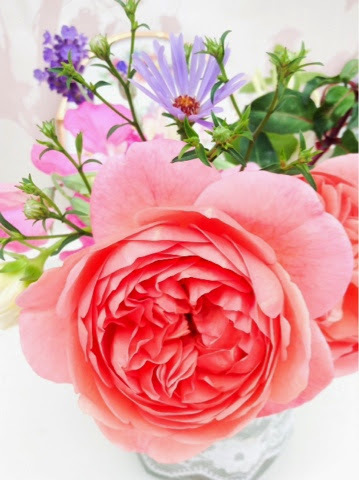 If you want beautiful scent then why not try growing David Austin Roses. The ones in this picture are called Boscobel. You may also like to try Jasmine, Honeysuckle, Stocks and Sweet peas. I've made this one for my Gran, who is poorly in hospital. 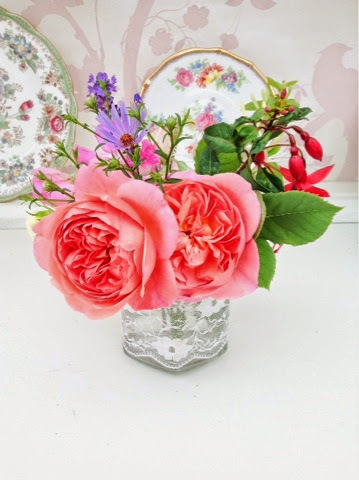 And was telling me on the phone how she had missed her garden this year, especially her Gertrude Jekyll rose! My Grandmother is my inspiration! She taught me to bake, knit, make a home and what the best roses are to have in your flower beds! I hope the scent of these roses will bring a smile to her face. Get better soon Nan! Hope everyone has a lovely week end.